Worth County offers a skilled and hardworking labor force settled in a centrally located strategic Southeastern locale. 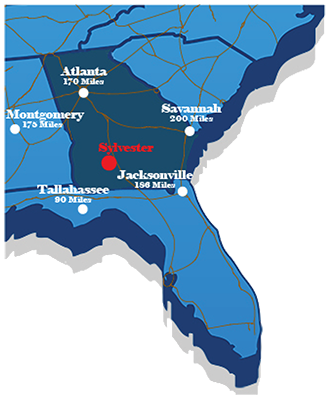 Our 196 acre Worth Industrial Complex is certified Georgia Ready For Accelerated Development and is located just 15 minutes from I-75, 175 Miles from Atlanta, 200 Miles from Savannah and 190 miles from Jacksonville, access to the world is within easy reach. Our municipalities and rural areas offer a warm, inviting, and peaceful lifestyle with all the necessary amenities to accommodate your business as well as the families of your employees.